Ok, it's been a almost a year since I've shown you guys anything from Stone Ridge Creamery, the inhouse brand of ice creams from SuperValu owned grocery stores. The maestro behind these flavors does a lot with these "budget" flavors, and there seem to be several new flavors in my area this year, so let's see if we can figure out which ones everyone should try. As much as I say that I don't like traditional cheesecake, I am a believer that there is a funky intersection between fairly cheesy and nicely berry. When a flavor crosses the road there, like Stone Ridge does here, the flavors really play well off each other and amplify the positive aspects of each. In other words, it makes me want to scoop scoop scoop. It's what I deem a "fun" flavor. Now these are still budget (entry level) ice creams, so you don't get a ton of mix-ins, but I do like the crust bits. If they could double up the bits, a flavor like this would easily keep pace with any of the competition. As is, at this price point, I've got no complaints. 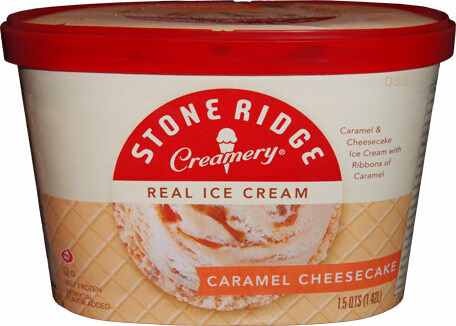 I've always had good luck with these Stone Ridge Creamery flavors. Consider the streak maintained! We've got another neat looking ice cream. 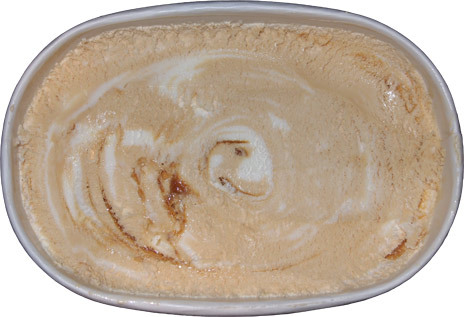 The swirls of each flavor stand out well, plus we've got a gooey caramel swirl to aim for. Digging in, the caramel is quite strong while the cheesecake flavor is having trouble coming through. I still like it as a caramel flavor, but if you were hoping for the cheese, it's not showing up, not on this scoop, and not on second scoop. It's a shame because the caramel isn't a very buttery or sweet caramel, so a bit of cheezy would have made this one more intriguing and fun. I also miss the crust bits from the other flavor. I know we're going a little fast here, so I want to re-emphasize this is a decent flavor, it's just mislabeled. See, one of the things that keeps me intrigued by the ice cream industry is studying how vastly different two flavors can be despite both having cheesecake in their name. While the berry perfectly accentuating and amplified the cheese flavor, the caramel completely kills the cheese here. It's a robust (coffee-ish) caramel, so it's nice and complex, but where's the cheesecake flavor? This point is driven further home by the strong aftertaste of what we'll call roasted caramel. Bummer. 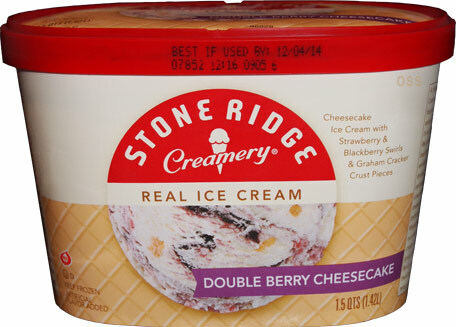 Double Berry Cheesecake is the flavor I always buy when Stone Ridge goes on sale. Butter pecan is DISGUSTING. PECANS TASTE SO OLD!!! Nastiest ice cream I've ever HAD. I love ice cream, and i'm picky. My favorite Stone Ridge ice creams are the Cookies & Cream (loaded with cookies) and Peanut Butter Cup (again, loaded with candy pieces). They are as good, or better, than the well-known big name brands. When trying to decide which flavor of STONE RIDGE ice cream to buy this time, by the store freezer, several people started to mention their favorite flavors, and then we all agreed that there were NO bad flavors. I have not found a flavor that was not better than any other brand that I have tried. The NEW Limited Edition Cinnamon Snickerdoodle flavor is DELICIOUS!!! Fount is in early November 2015 at Shoppers Supermarket stores in Maryland. VERY rich Cinnamon flavor with chunks of snickerdoodle. Finally an ice cream with NO NUTS! for those with nut allergies. Technically it's not new, but agreed, it's delicious! I was told at my local grocery store that Rocky Road has been discontinued. Please SAY IT AIN'T SO. That flavor was sooo good. You guy's ever going to come out with a banana pudding ice cream if so when i love all the nwe flavor's that's out . This is the first time i tried Stone Ridge Ice Cream and it was great. My choice of flavor was chocolate Cherry Bordeaux and i was very pleased with the taste and that the cherries were in chunks big enough to have to chew. I was buying the Blue Bunny brand but they started putting small bits of cherries in their ice cream and my usual purchase was chocolate chip bits with cherry, it had nice chunks of cherries but over time the cherries became ao small I couldn't tell them apart from the chocolate chip bits. I really enjoy your ice cream and will be looking for more flavors in my grocery store. I quit buying the Bunny brand because of their change in the amount of ingredients they used. 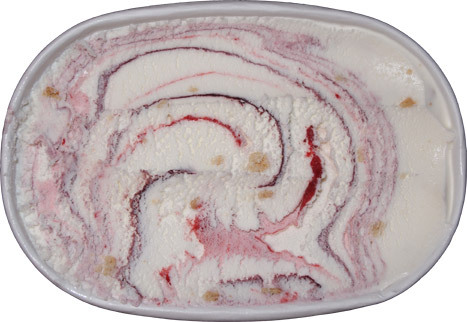 The only other thing i can say for Stone Ridge Ice Cream is that they give good sized chunks of cherry in their product and will continue to buy my favorite ice cream from Stone Ridge Ice Cream flavors. Thank you for making a quality Ice Cream with ingredients you can see and taste. Keep up the good work. Just tried the double berry cheesecake...even better than I had hoped for! The big ribbons of berry filling were perfect, and though I could wish for more cheesecake crust bits I was driven to have a second big scoop. Wish I had a bigger freezer. And the best part was this was at the local 99Cent Only Store! When you can get a luxury for a buck I say this is the best country in the world!